Jeff Marsick is a Connecticut-based comic book writer. 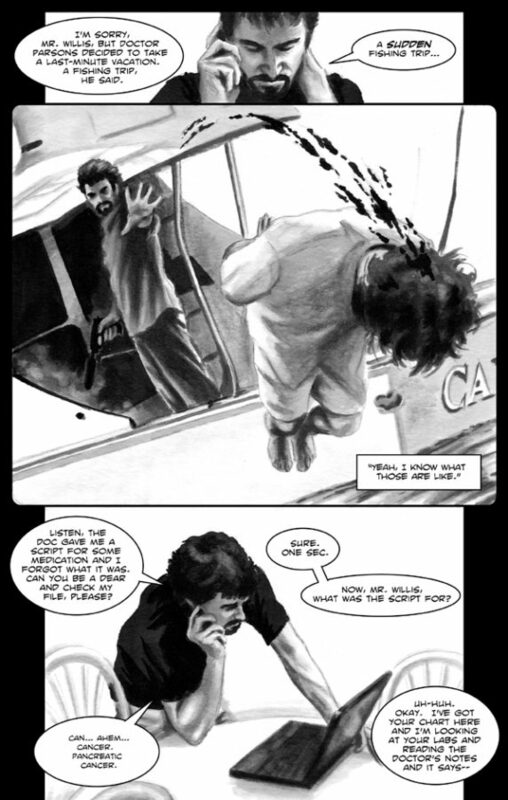 Together with artist Scott Barnett (http://ww.ScottBarnettGraphics.com/), he created the noir thriller Dead Man’s Party. It was initially self-published before being picked up by Darby Pop. Darby Pop (and IDW) also hired him as a writer on Indestructible: Stingray #1. He has various other projects, which include writing and co-creating with artist Kirk Manley (http://www.studiokm.com/) of the self-published Z-Girl and the 4 Tigers. Jeff spoke to Indyfest about his work and future plans. IM: What is Dead Man’s Party about? JM: Dead Man’s Party is a noir thriller about an enigmatic hitman, known only as Ghost, who finds himself in a situation where he has no other option than to put a contract on his own head by arranging a Dead Man’s Party. In the assassin trade, it’s part Viking funeral and part Irish wake, a way for your peers to either honor your memory or get even. Five assassins have thirty days to come find you and put you down, and the contract is irrevocable. After everything is set and the clock starts running, however, is when Ghost discovers he’s made a terrible mistake. IM: Did you invent the term “Dead Man’s Party” (in the context in which it’s used here)? 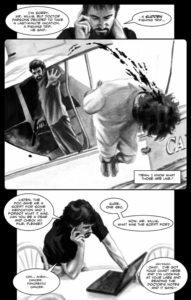 I share credit for the term with co-creator and series artist Scott Barnett, as it relates to this comic book, but the inspiration is wholly from Danny Elfman and Oingo Boingo’s song of the same name. Ever since I first heard that song, this concept is the movie that has always run in my mind’s eye. IM: Dead Man’s Party was self-published before being picked up by Darby Pop. How did that come about? JM: In 2014, Darby Pop had a contest for writers using a character from their Indestructible comic series. I won the contest and my script was produced as a comic book, Indestructible: Stingray, which came out in June of 2015. 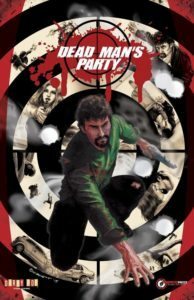 I pitched Dead Man’s Party to them as a possible series for them to publish, and they loved it. At the time, Scott and I only had three issues completed, the fourth was at the printer, and the script was written for number five. Darby Pop asked us to finish the series in “floppy” form and then they would publish the series in its entirety as a trade paperback. JM: It’s actually been pretty flawless and smooth working with a publisher. Jeff Kline and Renae Geerlings at Darby Pop essentially said that they loved what we had done and, aside from some minor tweaks, they weren’t going to make radical changes to the story. So, in that sense, the experience hasn’t been significantly dissimilar. Scott and I consider ourselves pretty strict when it comes to creating, editing, and putting out a product that is as good as we can make it. 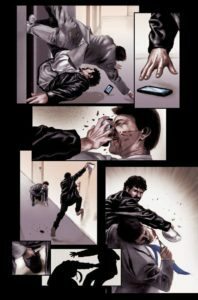 From outlining the story, to writing the script, to rough pencils, to finished art and lettering, we pore over every panel of art and each word of dialogue to make sure that our comic looks as professional as possible for a self-publisher. Jeff and Renae run a similarly tight ship, but since they’re not at the creator level for this project, they have a high-altitude view of the overall story, and they’ve been able to see where something doesn’t work or where Scott and I may have been too narrow in our focus. Jeff and Renae have years of comic publishing experience between them, so we hold their opinion and input in high regard. Where working with a publisher is very different, however, is in the marketing and promotion of the book. Scott and I were selling primarily at conventions and through a handful of stores that we developed relationships with. Under Darby Pop’s banner, though, we are able to take advantage of their distribution reach and get into more stores. We also published the series as individual issues, and in black and white. 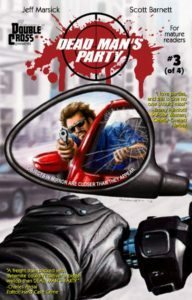 Darby is producing the entire series as a trade paperback collection—in color—which means that Dead Man’s Party has a future in the graphic novel section of bookstores and on Amazon. Pulling that off as self-publishers would be cost-prohibitive for us, unless we ran a Kickstarter campaign. JM: Our target audience is primarily older teens and adults. Because of language and violence, Dead Man’s Party is certainly not a kid’s book. I’ll put it this way: if Dead Man’s Party were a movie, it would be rated R. Anyone who is a fan of the Bourne movies, or the Taken series should really enjoy Dead Man’s Party. IM: Are you planning other stories set in the Dead Man’s Party universe? JM: While crafting this story, Scott and I have discussed a myriad of characters, scenarios, plots, and conflicts, and a bunch of material had to be left on the cutting room floor. All of it, however, has the potential to be fleshed out into more stories set in this universe of ours. I know Scott is itching to use a character I used in a short fiction piece for Out of the Gutter Online (http://www.outofthegutteronline.com/2013/12/smoke.html), which could be fun. So yes, if this does well, we’ll certainly go back to doing more. JM: I’ve been around the block a couple times. I’m a graduate of the United States Coast Guard Academy and I was a Coast Guard officer for six years. When I left the service, I went to chiropractic college and became a chiropractor and a nutritionist, but after a few years of fighting with insurance companies, I changed careers and became a financial analyst. I am currently working toward reinventing myself—again—only this time as a high school math teacher. Through it all, however, I have always been writing, as much as the margins of my professional and personal lives have allowed me. JM: I was working in Manhattan as a financial analyst when I learned of Comics Experience, a company run by a former Marvel editor Andy Schmidt that offered a course called Introduction to Writing Comics. 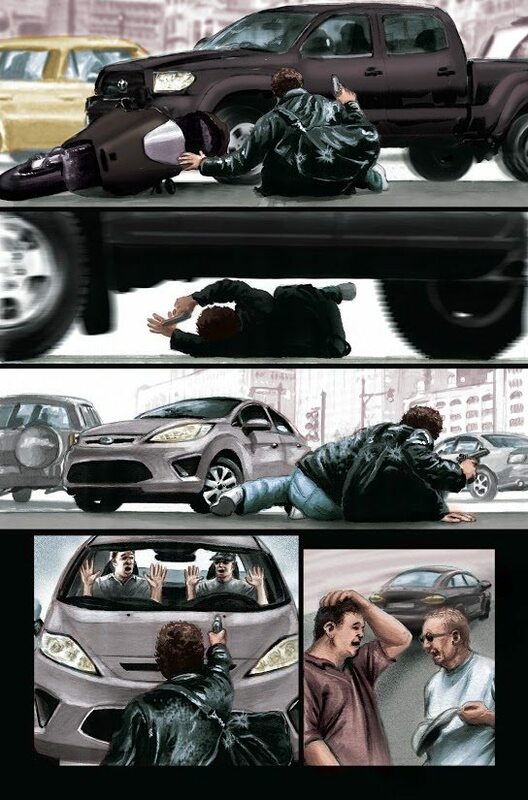 Ever since I was a young lad reading issues of The Flash and Daredevil, I had been interested in writing comic books, so I figured this was a great way to figure out not only how to do it, but also, how to get a foot in the industry. The course was terrific, and I cannot recommend Comics Experience enough to anyone who wants to get into writing, drawing, lettering, or even editing comic books. The primary takeaway, however, was that a creator doesn’t need DC or Marvel or Image in order to turn a dream into reality. 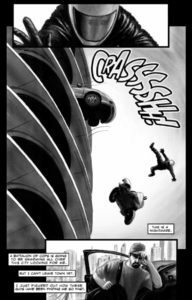 As a result of the course, I got turned on to self-publishing, contacted two artist friends of mine, Kirk Manley and Scott Barnett, and started discussing how we could go about creating comics. Six years later, I have two series, Z-Girl and the 4 Tigers, and Dead Man’s Party. IM: I saw in another interview that you had written a novel, short stories, and a screenplay. Did you publish (or option/sell) any of them? JM: I wrote a fantasy novel, Sula Ruin, that I shopped around to several publishers and agents and, while they were complimentary, everyone declined. This was before self-publishing through Kindle was a thing, though, so the manuscript will not be staying much longer lost in my desk drawer. I have done a couple of short stories for Out of the Gutter Online, and I wrote a pair of television pilots with my buddy, Scott Malchus, that have semifinaled in screenplay contests and are currently up for consideration with Amazon Studios. One of these days, something’s going to hit, I know it. Until that something does, though, I have to keep on creating and publishing. IM: You were the winner of Darby Pop’s “Breaking into Comics” contest. Can you tell us more about it? JM: That contest was fantastic, not only because it led to the publishing of my first mainstream comic book work between Darby Pop and IDW, but also for the subsequent door it has opened for Dead Man’s Party. In a nutshell, Darby Pop’s contest was to write a script in 30 days, using a character, Stingray, from their Indestructible comic book universe. One script would be chosen, the story would be published, and the writer would get $500. Now, this was a challenge, because Stingray only appears in a total of about six pages throughout the first five issues. 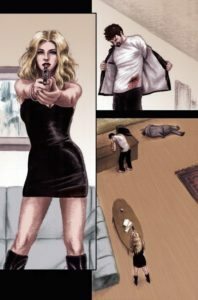 In that arc, all we know is she is a former member of the League of Defenders group of heroes, someone who has fallen from grace and, when we first meet her, she’s being released from a stint in prison. The next few times we see her, her actions intimate that incarceration has not quite cured her of a questionable moral character. That was all we had to go with. The contest stipulated that we could do anything we wanted with her: create an origin, envision her in the future, or continue the storyline as established in the comic. I wrote an origin of sorts for her, basically her introduction to the League of Defenders, all wide-eyed and naïve. Except, not everything was what it seemed. And out of a few hundred submissions, I won. We’re discussing possibly doing more with Stingray with a limited series, which would be fantastic. IM: What is Z-Girl and the 4 Tigers about? JM: Considerably different from Invincible: Stingray and Dead Man’s Party, Z-Girl and the 4 Tigers is another self-published comic book that I write and co-created with my friend and artist, Kirk Manley. Z-Girl is a centuries-old, heroic, female zombie. When’s the last time you ever heard of that, huh? She leads a unique special operations team composed of the Tigers, who are human hosts of ancient Chinese warrior spirits. So, what that means is, while a host can perish, the spirit is eternal, and it will seek out another worthy host to inhabit and then bring the team back together. In this way, they have been together, in one incarnation or another, since about 300 BC. As a team, they are at the forefront of protecting humanity against the monsters and demons that try to wipe us out. 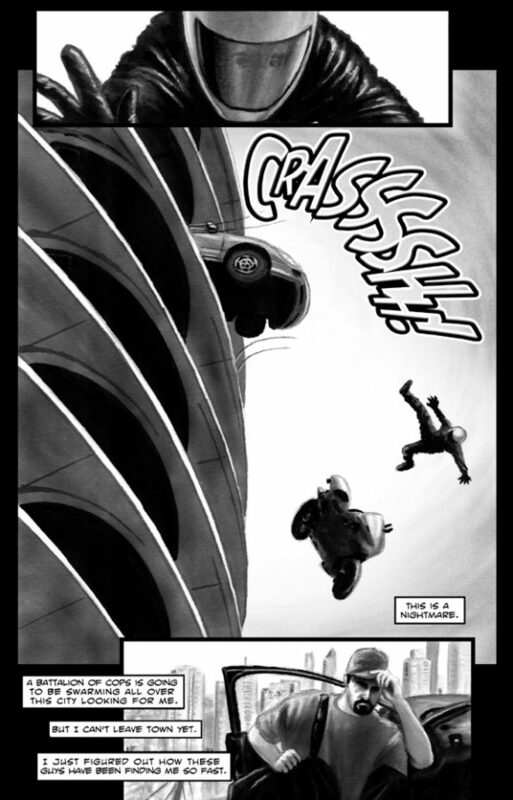 It’s a science fiction and adventure comic with elements of horror and mythology thrown in. Kirk and I have finished the first five-issue story arc (available as print on-demand that can be ordered from our website, www.ZGirl.org), we did a standalone issue for last year’s New York Comic Con, and we are at work on the next arc. We even have a gorgeous action figure, too! JM: Before the publishing deal with Darby Pop, Dead Man’s Party was distributed the same as with Z-Girl and the 4 Tigers: through conventions, our websites, and grass roots campaigning at the local comic shop level. We have made friends with a handful of comic shop owners, which is great and we are extremely grateful for them carrying us on their shelves, but we’re not in enough shops—especially outside of New England—to be a known commodity in the ranks of the independent publishers. 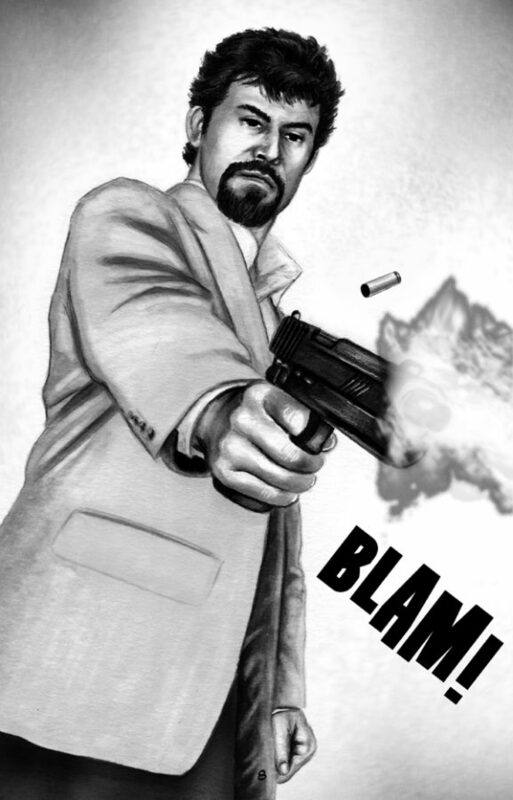 Both books are also in digital format for download on Comixology, Drive-Thru Comics, and Indyplanet. We do all of our own marketing and distribution, which can be difficult, since we all have day jobs and family obligations, too. But word of mouth and a presence in social media has helped our sales. JM: I think it has certainly made creating comics even easier to do. Writer, artist, and editor don’t need to be in the same zip code in order to collaborate. For instance, on Invincible: Stingray, I wrote the script in Connecticut, the artist drew the book in Italy, and the editor massaged it all together in California. I know that for Scott and Kirk, technology has certainly made drawing comics an easier endeavor. Also with printing, since we send digital files to the printer, any mistakes, additions, or deletions are easy to make happen. IM: How important to do think it is for creators to have their work in bricks-and-mortar comic book shops as well as online? For the record, though, it’s a milk crate I sell from. Secondly, for as much as people are online, I’m not convinced that they’re buying much beyond the big publishers for digital downloads, and there are far too many websites to stroll through in order to find great comic books. I think comics, even more so than books, are best enjoyed physically over digitally. 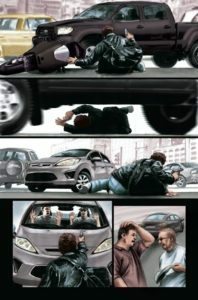 And personally, I know that I’ve been disappointed by buying a comic solely based on the cover and the description. Even with mainstream books, I want to be able to flip through them and get some sense of the writing and the art, which is something you can only do at a shop. Being only online—which can be a sound business strategy from a financial standpoint—I think it makes a creator miss out on a huge opportunity by not being in stores. JM: This is a great question, and I’m going to talk out of both sides of my mouth when I answer with both ‘yes’ and ‘no’. Yes, all of those avenues for delivering comics do create a four-lane superhighway of marketing congestion. Everyone’s inbox is already saturated with noise that they take three seconds to evaluate as either ‘read’ or ‘trash,’ and our inbox filters need filters. So, getting noticed these days, I think, is harder than it has ever been. But, a difficult environment forces creators to foster some ingenuity and creativity, not to mention really puts the onus on them to develop a book that is unique and really stands out. Podcasts, social media campaigns, personally meeting with shop owners, basically anything where a creator can put more of a personal touch on their marketing, I think, goes much farther than simply MailChimping out a press release. Oh, and blind stinking luck is an amazing asset, too. IM: What future plans do you have? JM: Hopefully my future involves writing the screenplay for the Dead Man’s Party movie! I have two sci-fi comic book concepts to pitch to publishers, I’m writing a thriller novel, and I’m working on another movie screenplay. Then there’s the next two issues of Z-Girl and the 4 Tigers to write and maybe get a Stingray limited series off the ground. I’ve got lots of plans for 2016! IM: Will you be attending any upcoming conventions or other events? JM: I know for certain that both Dead Man’s Party and Z-Girl and the 4 Tigers will be at Terrificon at Mohegan Sun in Connecticut on August 19–21, and we’ll be in our usual spot next to the Marvel booth at the New York Comic Con from October 6–9. I will also be with Darby Pop for the Free Comic Book Day event at Jetpack Comics in Rochester, New Hampshire, on May 7. I hope to be at other conventions and venues, but we’ll see what I can commit to as the year goes on. JM: I could probably write a book on the topic given all the lessons I’ve learned (the hard way). First and foremost, if anyone reading this really absolutely, positively, don’t-tell-me-I-can’t-do-it wants to start their own comic—and I’m talking primarily about a series, or a limited series, not so much a one-off—then they have to approach it with a business mind-set. Even if it’s meant to be nothing more than a hobby, a creator needs to think of it as a business venture. Why? Because it costs money. 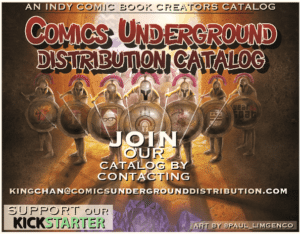 Even if the creator is writer, artist, colorist, letterer, and editor all in one body, printing and marketing and distribution and conventions all cost money, and those costs can quickly spiral out of control. I’m not necessarily saying there needs to be a formal business plan in place, but if a creator wants to be serious about their product getting noticed, it has to be treated like a small business operation. And having a professional look or appearance will go a long way toward helping someone and their creation get noticed. Secondly—and this is the subject of an article I wrote for this very magazine—let’s say you’ve written and drawn the first issue of a series. You’ve printed it, you’re looking at it in your hands, and it’s gorgeous. Bravo and congratulations. Now, put it away and get the next two issues complete and printed before you start marketing, or even thinking about selling, the first issue. This is so very hard to do, because you’ve metaphorically just given birth, but you have to do it. Why? Because self-publishers are notorious for being late, delayed, or even murderers of a series before it even gets legs. Marvel and DC put out—for the most part—a new issue for each title every month. Every month, you know you’re coming back for Batman or Superman or Wolverine. 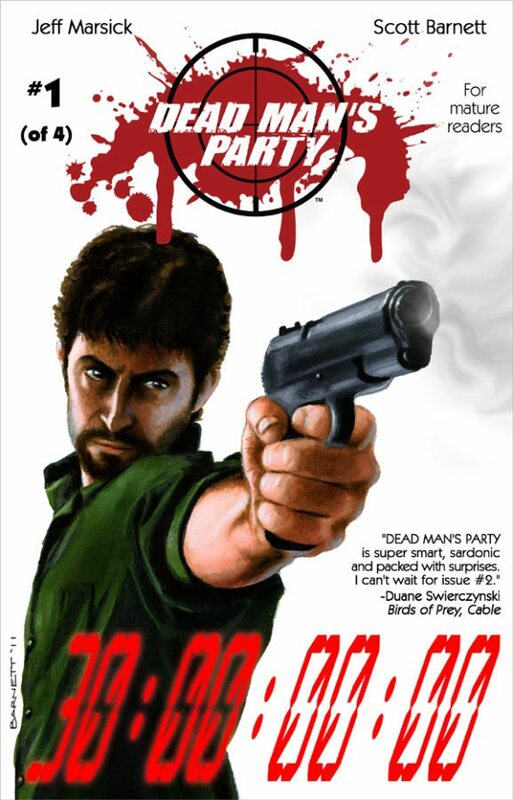 Readers know and respect that self-publishers don’t create comics as a day job, so if Dead Man’s Party comes out every other month, or once a quarter, well, that’s something of a regular schedule, so we’ll get the benefit of the doubt and a reader will take a chance on us. But a book that comes out this year, then the second issue a year from now, a third two years later, it’s likely to be pretty much dead in the water. That first issue could be amazing, or the series could really be getting on its feet, but without regularity of release, it’s going to be forgotten, if not abandoned outright. What I have found is that people typically shun an independent book until an entire arc is complete, so that they can be sure of getting the whole story. As a creator, you want to develop buzz for your product and capitalize on momentum, so the best way to do that is to have several issues already ‘in the can’ before you start releasing them. This harkens back to the brick-and-mortar question, too, because a store won’t want to carry your book if they can’t be assured that subsequent issues will be timely in arriving. Third, and most important: stick to it. Whether you are a writer or an artist, I know what it’s like to have that creative itch that only getting something onto paper can scratch. So do it. And do it often. I obviously speak from a writer’s perspective, but being an artist or a letterer or an editor is not all that different: it’s creative exercise. And the only way you get better at your craft is by working out every day. I look back on some of my first scripts, the ones I thought were pretty damn good, and they’re positively groan-inducing. My writing has gotten much better, because I practice often. Now, the first comic you create may be hailed as the most amazing thing that’s ever been produced since Peter Parker crawled up his first wall, but the odds are that, nope, it won’t be. It may not ever be noticed and maybe only family and friends buy a copy. But if that inner muse in you still believes you have a story to tell, then don’t give up, and go back and do it again. The comic industry for self-publishers reminds me of gym culture back in my powerlifting days. You show up and sling some weights around, the veterans who have been there every day for years are unimpressed. But after showing up for months on end and pushing yourself each time, the old guard sees that you’re “worthy” and starts coming around, and they slowly accept you as one of their own. If you create a comic book, become a fixture at conventions, be friendly and conversational with fans and shop owners and critics, and—as Joe Dirt would say—“keep on keepin’ on,” you’ll slowly become recognized and accepted by those who have done exactly the same thing. It’s an industry that rewards and respects tenacity, so don’t give up. 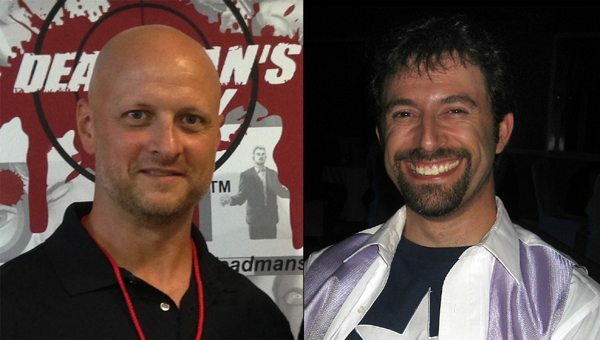 This entry was posted in 92 and tagged Dead Man’s Party, Jeff Marsick, Kirk Manley, Louise Cochran-Mason, Scott Barnett on February 3, 2016 by aipman1.